The CB Congregation has its Mother House and Generalate in Maastricht, the Netherlands. Here, the General Superior lives and works with her General Board to oversee the running of the Congregation. The CB Congregation is divided into Provinces (i.e. the Dutch and Indonesian Provinces), which covers a particular geographical area. Each Province is independent and is headed by a Provincial Superior. Areas which have not been raised to the status of Province are known as Regions (i.e. 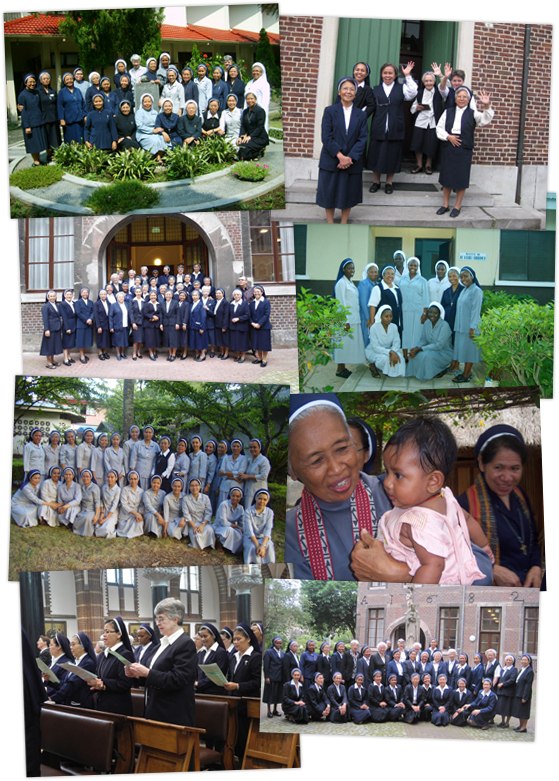 Tanzanian, Philippine and East Indonesian Regions), Units (Norway, Belgium, and USA) and Mission Areas (i.e. Brazil), depending on size. In time, as they grow in numbers and strength, these too will become Provinces. Each Province holds a Chapter every six years to elect its new officials and set out its vision for the coming six years. In the Regions, a Chapter is held every three years. Unlike in the Province, in the Regions new officials are assigned by the General Board after conducting an opinion polling from the Sisters in the Region concerned. 2 Responses to "Worldwide CB Members"